A few weeks ago I did a quick test to try out my best macro lens with a 1.5x teleconverter I had just bought. The results were good and takes me one step closer to that special level of magnification I eventually want to get to. If you don’t know much about macro photography, read this wikipedia article to get a quick overview. Eventually I’d like to have a setup were I can focus on features of small insects, such as filling a full image frame with the structure and detail of their eyes. Generally I put the camera into manual focus mode and completely extend the focusing tube to maximum magnification. Then I try to hold as steady as possible to frame and select what slice of image I want to be in focus. With such small objects, it’s quite difficult to stay still enough, so I think in the future I will look into getting a ball head monopod, which should help with stability yet still offer a decent amount of mobility. 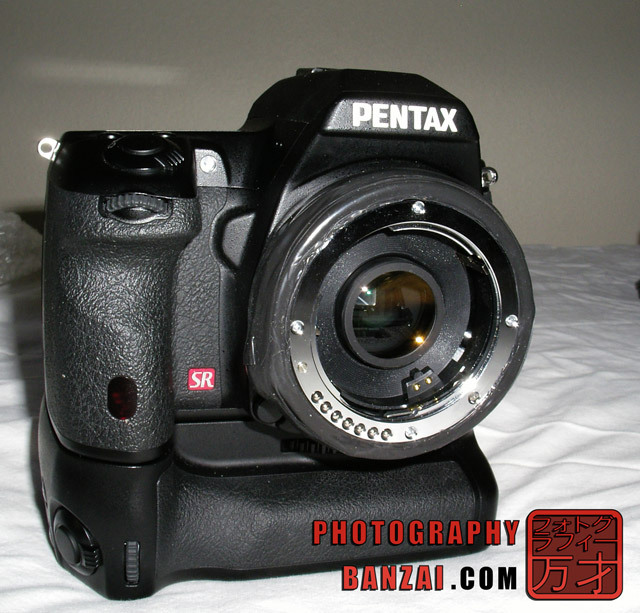 – Pentax K-7 camera body with battery grip. – Pentax D-FA 100mm WR Macro lens. This has a maximum of 1:1 magnification. 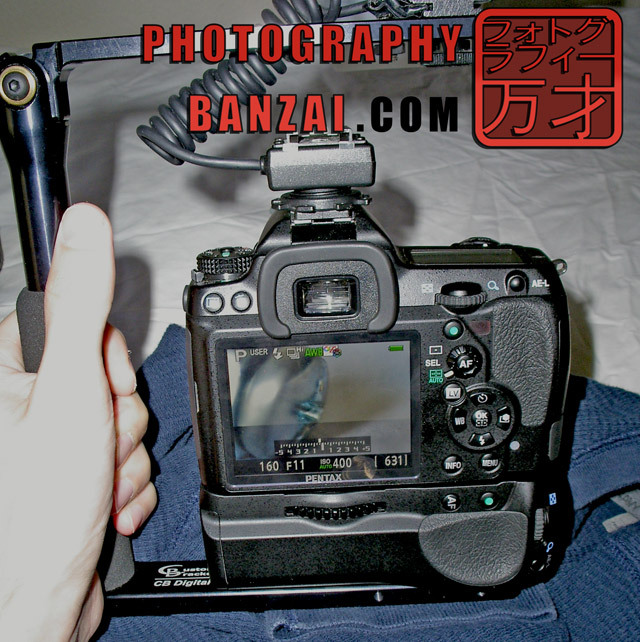 – Custom Brackets CB Digital-S camera flash bracket. – Adorama flash extension cord with a pivoting flash connector. 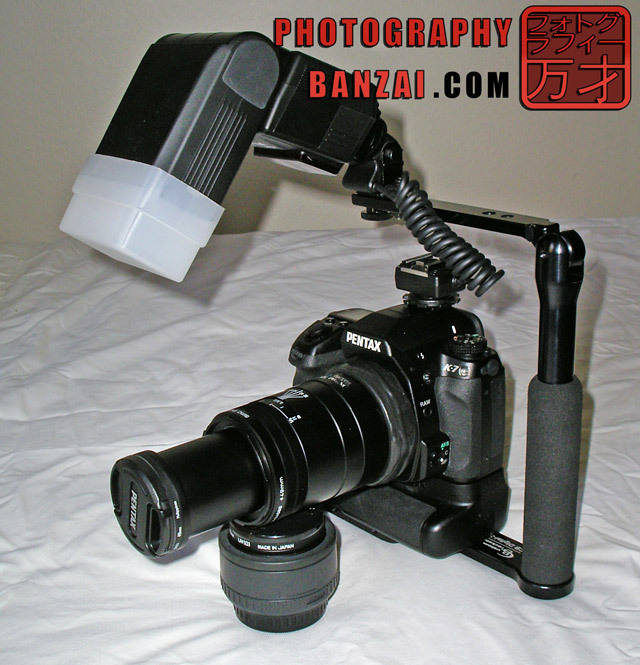 – Sigma EF-530 DG SUPER flash with a plastic diffuser angled down toward the lens. With the teleconverter I’m able to gain more magnification without having to lose working distance. I’d like to eventually get bellows, extension tubes, or a 3x teleconverter to see how the 100mm Macro lens does with even more magnification. Most of the macro setups I see use a reversed lens, which I’d eventually like to try as well. What I like about the current is setup that it has a full data connection between the lens, camera, and flash meaning I can let the camera manage most or all of the settings, so I can focus on composition. The large silver thing on the right not in focus is a screw head showing how thin the depth of field is. 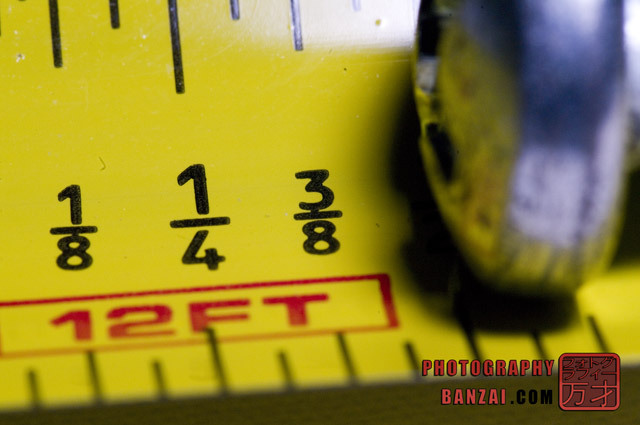 The 1/4 stands for 1/4th of an inch, so there is quite a good deal of magnification happening. This entry was posted in Article and tagged camera bracket, d-fa 100mm f2.8, detail, flash, grass hopper, macro, rig. Bookmark the permalink.